Yet another important application has been added to Flathub, a service for hosting and distributing Flatpak applications: WPS Office, making it even easier to install and update on Linux. 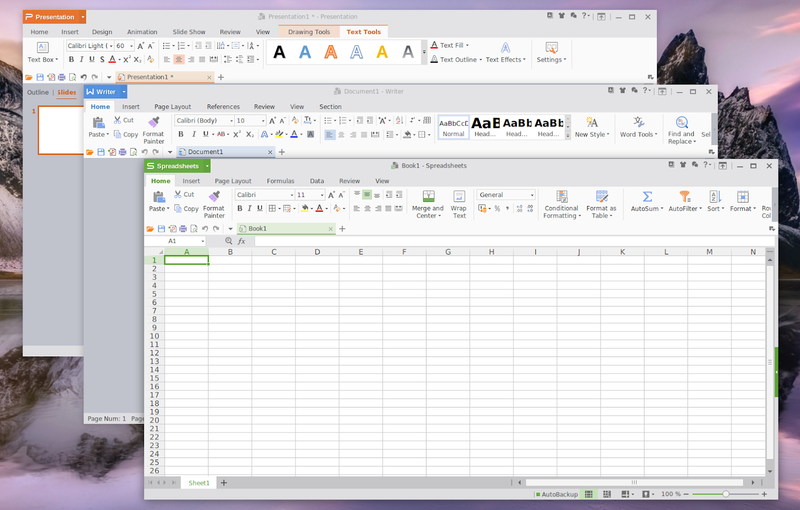 WPS Office is an office suite for Windows, Linux, Android and iOS, that includes three components: WPS Writer, WPS Presentation and WPS Spreadsheet. The personal basic version is free to use (but not open source software), with a professional version being available for a subscription fee. The application website mentions the suite is compatible with Microsoft Office formats like PPT, DOC, DOCX, XLS and XLSX in both reading and creating such documents, while also allowing saving files as PDF. Developed by Kingsoft, a Chinese software company, the application uses a Qt "Ribbon" interface, and it currently support 27 languages, including Chinese, English (US), French, German, Italian, Portugues, Russian, Spanish , and more. To install WPS Office from Flathub, you'll need to install Flatpak and add the Flathub repository. You can find instructions for how to do this on the Flathub quick setup page. It's worth noting that the Flathub Ubuntu quick setup page mentions adding a PPA. You only need to add the PPA for Ubuntu 16.04 and 18.04. For Ubuntu 18.10 and newer, skip adding the PPA (so don't use the first command from that page) since there are no packages for Ubuntu version 18.10 and newer yet. Do follow the rest of instructions though. You only need to setup Flatpak and Flathub once. After that you'll be able to take advantage of the large application database it offers for installation with minor effort. After setting up Flatpak and Flathub, head to the WPS Office Flathub page and click the install button. If you're a Gnome user, you can also search for it on Gnome Software / Ubuntu Software and install it from there.